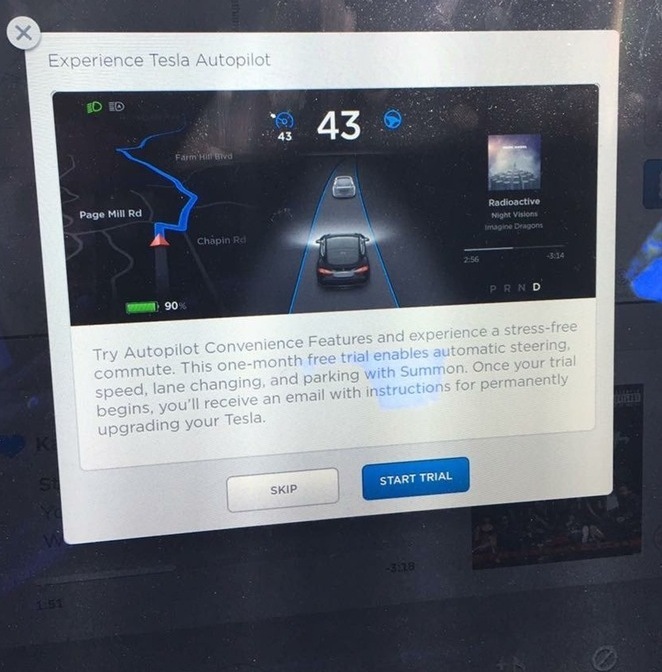 If you own a Tesla Model S or Model X but didn’t feel like forking over $2,500 for the company’s new Autopilot software, you’re in luck: Tesla drivers can now get a free taste of what a more autonomous future could be like with a monthlong trial of the feature. Model S and Model X owners had the choice to pay $2,500 for Autopilot — which offers self-driving functions like hands-free parking — when they purchased their vehicles, or for $3,000 as an add-on after the fact. In what appears to be an effort to help convince customers that it’s worth all that cash, Tesla is now offering a month free — at least, according to an image posted to Reddit that appears to be a pop-up screen. Previous Want To Help Us With A Guide? Send Us Your Dish Bill!